A Pageview in Monkey Business Learn how Monkey Business builds a complete Pageview by combining contents in a Website Template and Page together. Your User Guide to Monkey Business from AJIBOYE Monkey Business Agency. Learn how to use Monkey Business Management System to build your business FAST. A Pageview in Monkey Business is a combination of contents of a (1) Website Template and a (1) Page. All the content within the red outline is saved in, and coming from the Page, while everything else is saved in, and coming from the Website Template. To edit contents in the Page, you will select Edit This Page from the Shortcuts Menu. To edit contents in the Website Template, you will select Edit This Template from the Shortcuts Menu. Website Templates in Monkey Business holds content that are shared across multiple pages, such as logo, navigation menus, search options, and so on. Each Website Template has a Stylesheet holding the CSS style code for the template. From any Pageview, select Edit This Template from the Shortcuts Menu, to modify the Website Template active in the Pageview. From any Pageview, select Edit This Template Style from the Shortcuts Menu, to modify the Stylesheet. To see all the Website Templates available on the website, use the Website Templates app. Pages in Monkey Business holds HTML code for the webpages, and are stored in the /documents folder. To build a Pageview for webpage, Monkey Business embeds the contents of the Page into the Website Template you choose when you create links to the Page, returning the combined content back to the user. 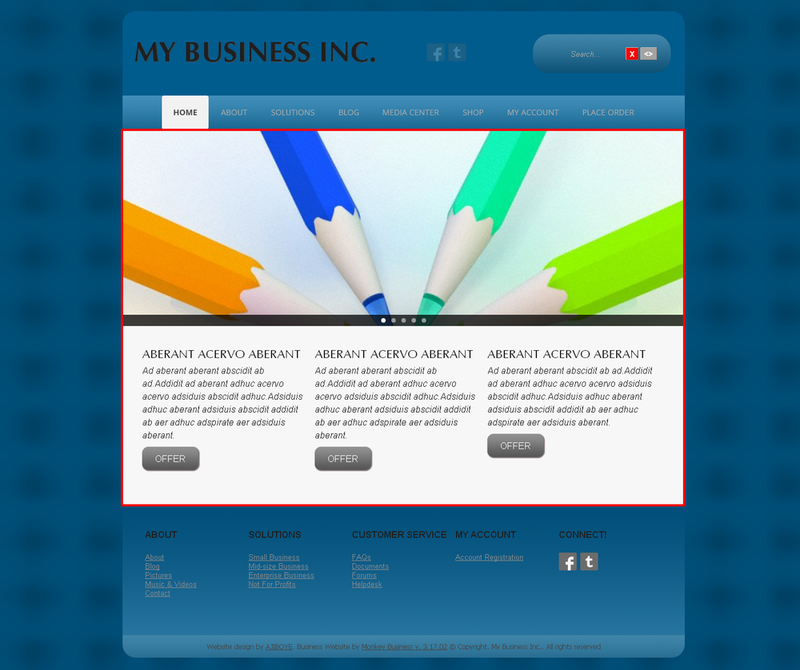 If you do not choose a specific Website Template for the Page, Monkey Business will use the active Website Template. To modify any Page, simply select Edit This Page from the Shortcuts Menu. A Pageview in Monkey Business is Dynamic, i.e. it is built in real time, on the fly, every time, by the Pageview Generator combining the contents in a specific Page and a Website Template. /viewer - replaces /documents folder, and tells Monkey Business to run the Page content through the Pageview Generator. /vts/ - tells the Pageview Generator to load the Website Template named about.